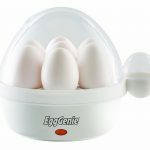 West Bend Egg Cooker Review: The West Bend automatic egg cooker is considered by many to be a versatile egg cooker, with a cooking capacity of 7 eggs. 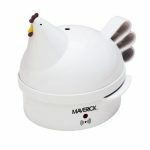 It has been engineered to serve eggs any way you like them whether you prefer them soft or hard boiled. With over 800 user reviews on Amazon the West Bend 86628 cooker is a popular model and with an average user rating of 3.9/5.0 it could make it into your gadget list. Users are particular impressed with how well this model poaches eggs. Easy to use – Poaches or hard- or soft-boils eggs at touch of a button. Cook up to 7 Eggs – Egg rack holds 7 eggs at once, so you can feed a small family. Audible Signal – Has a loud signal when it has finished cooking, which is a great improvement over other cookers. Measuring Cup – Includes measuring cup with egg piercing pin. Easy to Clean – Is easy to clean due to the removable egg tray. 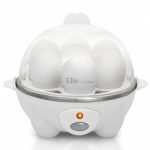 The West Bend 86628 automatic Egg Cooker is simple to operate, all it requires is for a user to fill the base of the appliance with the correct amount of water for the number of eggs you’re cooking and then turn on the power, almost fool proof. You will know that the eggs have been cooked when the alert sounds. 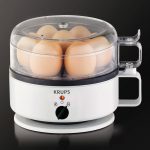 This unit comes with a removable egg rack that is easily capable of holding as many as seven eggs for either hard or soft boiling. If you prefer poached eggs then the appliance comes with a non stick poaching pan that can hold up to four eggs. The heat-resistant base of the cooker will stay cool during the cooking cycle and the clear lid will allow a user to monitor the progress. The cooker comes with its own water measuring cup that has a pin in the bottom, the pin is used to pierce eggshells when soft-cooking. This pin will guarantee that the eggs do not crack during the cooking cycle. Most users have found that the cooker works great. It is Simple to use and easy to operate. The eggs turn out perfect every time. You can put the eggs in the machine, pour the required measurement of water, turn it on, and within ten minutes seven perfect eggs. It cooks soft or hard boiled eggs perfectly, and poaches perfectly. The West Bend Cooker has been reviewed by over 830 customers on Amazon with a rating of 3.9 out of 5.0. “This is a great egg cooker. I have used them for years and just replaced it with this model. Getting harder to find them but I love using it for hard boiled and poached eggs. “This is a great little unit. My wife uses it mostly to make hard boiled eggs, and I have heard no complaints. I have yet to use it for soft boiled eggs, and I am the only one in the house who eats those. So far though, it has performed to expectations and is easy to clean due to the removable egg tray. 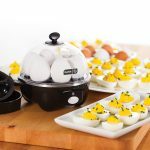 The West Bend egg cooker not only makes perfect eggs, from poached to soft-boiled to hard-boiled, the shells come off easily every time. It cooks beautiful eggs that will easily slide out of the base pan. Just put eggs into the machine, pour measured water, turn on, and ten minutes later seven perfect eggs. Compact size means it does not take up much counter space and is easy to store. A loud buzzer sounds when done. Keep an eye on the eggs through the clear lid. Take the measuring cup that is supplied with the cooker and add cold water up to the appropriate line on the cup required for the type of cooking consistency you are after (soft or hard boiled). The measuring cup has a small tip that you need to use to punch a small hole in the top of the eggs. Load the cooker with up to 7 eggs. Wait for the Buzzer to sound, which should take approximately 13-15. How do you clean the base? You can wipe the base with damp dish cloth a few times. Follow the instruction manual. Yes. A loud buzzer alerts you that the eggs are done. You must then turn off the buzzer or it will continue until turned off. You can cook between 1 to 4 poached eggs at the same time. How long does it take to poach eggs? It takes approximately 5 minutes. 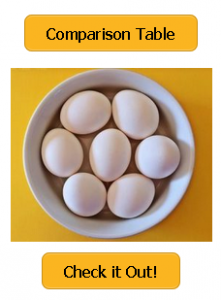 How long does it take to cook hard boiled eggs? It takes approximately 15 minutes. 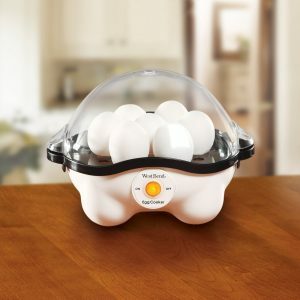 Visit the manufacturers website at http://westbend.com/automatic-egg-cooker.html to find the complete west bend egg cooker instructions guide.